It was inevitable, the 2016 Chevy Camaro had to have a four-cylinder engine. The archrival Ford Mustang packs a spunky 2.3-liter EcoBoost four-banger, and everyone from BMW to Subaru uses four-cylinders to great effect to power their sports cars. Now it's Chevy's turn. Again. The Camaro ran the infamous Iron Duke four-cylinder with 88 to 92 horsepower in the 1980s. It was a fuel-economy play at a time when performance was not a priority. After the 1970s muscle-car era, output even for the V8s didn't top 200 hp again until the mid-'80s. Thankfully for enthusiasts, things have changed dramatically in the last 30 years. The gen six Camaro will offer a 2.0-liter inline four-cylinder with 275 horsepower. It's the standard engine, slotting below the 335-hp V6 and the 455-hp V8. But don't mistake the new I4 for an Iron Duke encore. Camaro chief engineer Al Oppenheiser called it a "rock star" and said cars equipped with it feel lighter than V6 models. The four-cylinder (295 pound-feet at 3,000-4,500 rpm) also summons more torque in quicker fashion than the V6 (284 lb-ft at 5,300 rpm). Chevy expects the Camaro to hit 60 miles per hour in "well under six seconds," according to press materials. The Mustang EcoBoost (310 hp, 320 lb-ft) clocks times in the low to mid five-second range. "We're not doing it just so we have one," Oppenheiser said. "We're not doing it because like in gen three you're forced to do it because of fuel economy. We're doing it because it belongs in the car. It has a distinct character." Speaking with Autoblog recently at the Detroit Grand Prix racecourse on Belle Isle, Oppenheiser said he expects the I4 to attract a younger crowd to the Camaro and will put up stiff competition against the V6 for sales. 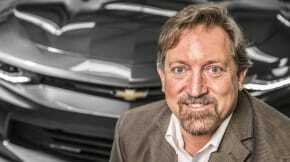 "I've read blogs where younger folks won't buy a Camaro because it doesn't have a 2.0-liter turbo or a turbocharged four-cylinder," he said. "So we're going to excite them." While we talked a lot about four-cylinder engines, Oppenheiser also elaborated on the V6 (It's pretty damn good, too. We drove it.) and the new Alpha platform that the Camaro borrowed from Cadillac. Here's the rest of our edited conversation. Autoblog: Talk a little bit about the four-cylinder – the first turbo four-cylinder ever for Camaro. Do you have any idea what the take rate's going to be? Al Oppenheiser: I think it's going to surprise a lot of people. It's actually a fun car to drive. It's got a really good balance of turbo noise and exhaust note. We don't offer the valve exhaust on that because we didn't want to chase a turner-car sound. This is a more refined sixth gen. We wanted to make sure that there's a no-excuse four-cylinder. I've spent hours in it. It's kind of funny because I was misquoted a few years ago about as long as I'm the chief there'll never be a four-cylinder Camaro, which I never said, but it kind of took on this identity on the Internet. And so, now for me to say, this thing's a rock star – a four-cylinder – I can't wait till we get you guys to drive it. You feel a lot of power, 275 horses. But it feels lighter even than the six. It just feels more nimble. It's a no-compromises car because you can buy a four-cylinder, but you can do the trim levels and get the leather seats and get all the options. We think there's a distinct four-cylinder customer. I think a segment of this four-cylinder buyer will be the kids that saw Bumblebee from day one and have grown up with four-cylinder cars like the Cruze and even HHRs and Cobalts. 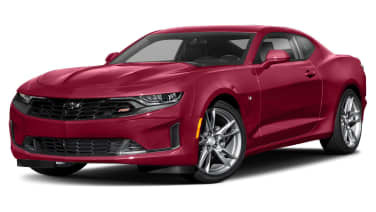 I've read blogs where younger folks won't buy a Camaro because it doesn't have a 2.0-liter turbo or a turbocharged four-cylinder. So we're going to excite them. I wouldn't be surprised if the four and the six battle each other for penetration into the segment in how many we'll sell. AB: It sounds like you're trying to sell it on its merits. AO: Absolutely. We're not doing it just so we have one. We're not doing it because like in gen three you're forced to do it because of fuel economy. We're doing it because it belongs in the car. It has a distinct character. AB: Tell us about the new platform? Why did you decide to go with Alpha? AO: We looked at the sixth-generation Camaro after the first year of the fifth-generation Camaro as part of the normal development process. The big thing for us is we wanted to take advantage of Alpha's structural efficiency, and the biggest thing is we're starting with at least a 200-pound weight reduction. We've got a chance to take what they've done so well with the Cadillac products (CTS, ATS) and make a Camaro out of it. We wanted to take advantage of this lightweight, efficient, and structurally superior architecture. In a sense, remove the stigma of mass from the Camaro. I'll give you an interesting thought here: The Mustang went from solid axle to independent rear suspension. Engineers know that you're going to add about 150 pounds to do that. Just the physics of IRS. We go from fifth gen to sixth gen, still have IRS, but we have a 300-pound weight reduction on the V6 to the V6. So somehow we were able to do it. AB: So the V6 to V6 is 300 pounds lighter? AO: Yes. That's why we say more than 200 [pounds], because you've got to start talking about all of the models. So the V8, we say is over 200 [pounds lighter] to its predecessor. The V6 is actually closer to 300. It's just under 300 to its V6 predecessor.